I’ve said some hard things on this page about the 45th president, but credit where it’s due: He’d never have come back with the miserable deal that Prime Minister Theresa May is trying to sell to an incredulous British public. The famous dealmaker saw right away what had happened. “It sounds like a good deal — for the European Union,” he told reporters as details emerged. For once, Donald Trump was guilty of understatement. This is the sort of deal that a country signs when it has lost a war. Under its terms, Britain will remain subject to all the costs and obligations of EU membership, but will give up its vote, its voice and its veto. 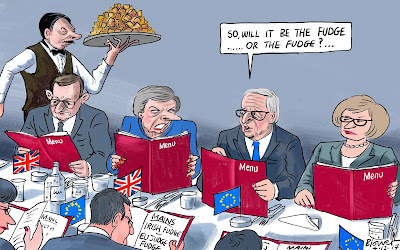 In Brussels, they crow that the sole change, for at least two and probably four years, will be that the U.K. loses its Commissioner, its Members of the European Parliament and its vote when the EU makes decisions. If the remaining 27 members now pass a measure deliberately designed to harm British interests — to shift business from London to Frankfurt, say — the U.K. will have to apply it. And at the end of that “implementation period”? The original idea, as the name “implementation period” suggests, was that the U.K. and the EU would use it implement a comprehensive trade relationship. In practice, they haven’t begun work on such a relationship, and the EU now has no incentive even to start. Why? Because of the so-called “Northern Ireland backstop.” Unbelievably, British negotiators have agreed that they will remain within the EU’s tariff walls, and contract out their trade policy to Brussels, unless and until the EU side is satisfied that there don’t need to be physical checks at the Irish border. The thing is, this is not going to turn out to be Brexit supporters turning on the idea. This deal is so blatantly bad for Great Britain, that it is actually the British establishment shooting itself in the foot. Nobody is buying that this is a good deal. No one is falling for it. So to put this to a vote, not only will it fail, it might actually topple the conservative majority in parliament. That's a bad thing. But with Theresa May on board with this deal, perhaps the party really needs a shake-up and a return to a Thatcher-like leader, just as the Republican establishment in America is undergoing a shake-up. Is ESPN no longer woke?